The goal of the contest is to promote mathematics education in New Mexico by rewarding students, teachers, and their schools for mathematics excellence. Between 700 to 1200 New Mexico students benefit from this program annually. The contest is open to all students in grades 7 - 12 as well as interested students in lower grades. The contest has two rounds of exams designed to test mathematical potential and ingenuity as well as formal knowledge. Round I is administered at the students's home school. Students from non-registered schools can take the Round I exam at the UNM campus as indicated in the Calendar of Events. The top finalists are invited to the UNM Campus in early February to compete in Round II. We will also continue the awards for the schools with the highest participation in the Contest First Round. The winners will be determined using the number of participants with non-zero scores on the Contest First Round scaled proprtionately to the school size. The annual contest is currently directed by professors Hongnian Huang and Jehanzeb H. Chaudhry. Sponsorship of the UNM-PNM Statewide High School Mathematics Contest comes from the Department of Mathematics and Statistics and a grant from the PNM. Prizes presented in addition with gifts from Mu Alpha Theta (the National High School and Two-Year College Mathematics Honor Society) and a generous discount from the American Mathematical Society. To find out more about Mu Alpha Theta, their scholarships, grants, free math competitions, and other benefits, please visit www.mualphatheta.org. NCTM, MAA, SIAM, and AMATYC are sponsoring organizations of Mu Alpha Theta. If you would like to support our contest, please click here to make a gift. 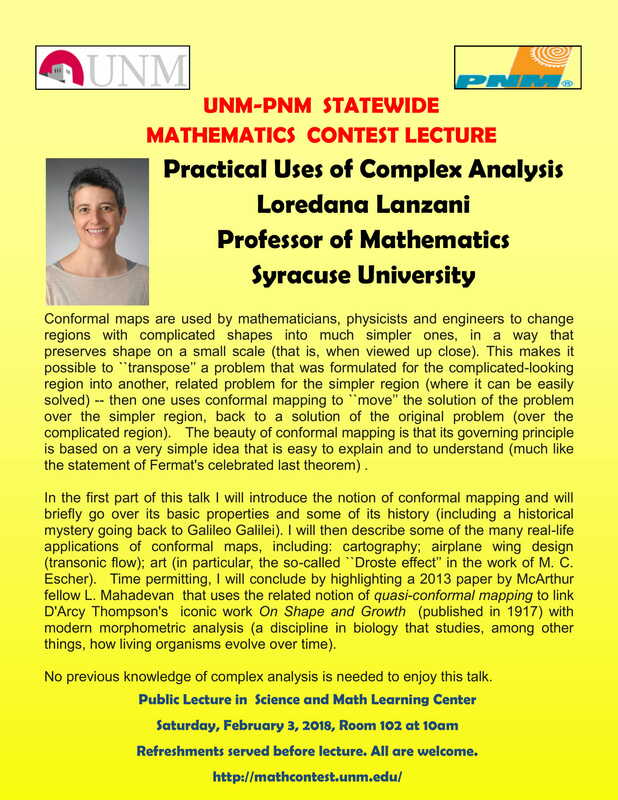 Public Lecture (at 10 am, Feb 2nd) in Science and Math Learning Center, Room 102. Speaker: Dr. Billy Brown, University of New Mexico. One can also watch the public lecture online. (Webinar ID: 261 250 827). Letters of Invitation announcing this year's contest are mailed to schools. If you or your school did not receive an announcement letter and you are interested in participating in this years contest please e-mail Hongnian Huang or Jehanzeb H. Chaudhry at the Department of Mathematics & Statistics. Schools wishing to participate can register after September 4, the deadline for registration is October 31. If you are a teacher wanting to register your school, click here. Students wishing to participate can register after September 4, the deadline for registration is October 31. If you are a student wanting to register, click here. An electronic copy of the Round I exam is made available to participating schools. A hard copy can be made available to schools that are not able to receive the exam electronically. The Round I exam is administered at registered schools throughout the state. Note: Please see the Campus Map for location. Parking in Lots B and C next to the buildings is free on the weekend with the exception of all parking meters and reserved spots. Round I Grading Session: Volunteer and UNM teachers meet in SMLC 356 at 9:00am to grade the exams. Refreshments will be provided. Round I exam results will be mailed to their respective schools. Letters are mailed to Round II qualifiers. Public Lecture (at 10 am) in Science and Math Learning Center, Room 102. Speaker: Dr. Billy Brown of University of New Mexico. Refreshments served before lecture. All are welcome. One can also watch the public lecture online. (Webinar ID: 261 250 827). Title: "Symmetry and the Tessellation Art of M. C. Escher"
Note: Please see the Campus Map for location. Parking in Lots B and C next to the buildings is free on the weekend with the exception of all reserved or metered spots. 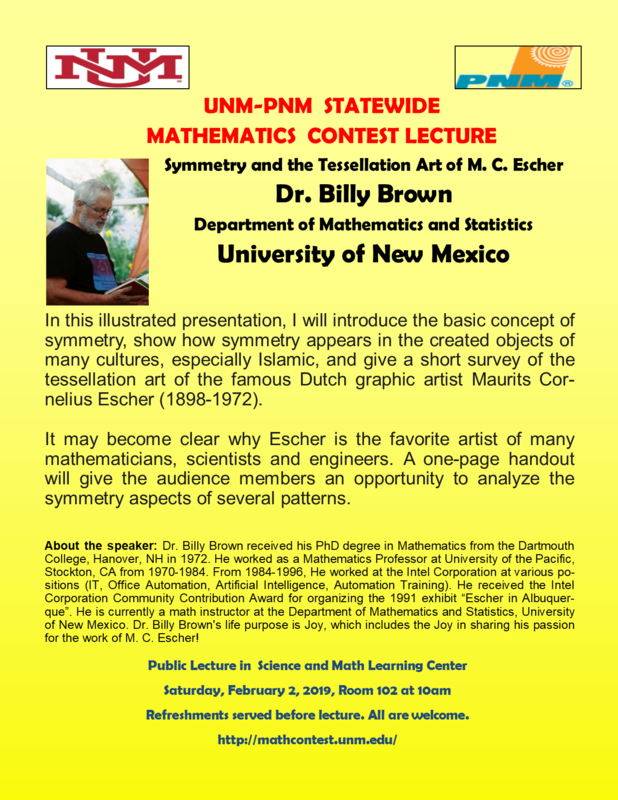 Banquet held at the Student Union Building on the University of New Mexico campus in Albuquerque from 11:00am-2:00pm, Ballroom C.
Public Lecture in Science and Math Learning Center, Room 102, 10am -11am, Saturday February 3, 2018. Speaker: Professor Loredana Lanzani of Syracuse University. Refreshments served before lecture. All are welcome. Title: "Practical Uses of Complex Analysis"